"It was some distance from the Brandywine to Frodo's new house at Crickhollow. They passed Buck Hill and Brandy Hall on their left, and on the outskirts of Bucklebury struck the main road of Buckland that ran south from the Bridge. Half a mile northward along this they came to a lane opening on their right. This they followed for a couple of miles as it climbed up and down into the country. At last they came to a narrow gate in a thick hedge. Nothing could be seen of the house in the dark: it stood back from the lane in the middle of a wide circle of lawn surrounded by a belt of low trees inside the outer hedge. Frodo had chosen it, because it stood in an out-of-the-way corner of the country, and there were no other dwellings close by. You could get in and out without being noticed. It had been built a long while before by the Brandybucks, for the use of guests, or members of the family that wished to escape from the crowded life of Brandy Hall for a time. It was an old-fashioned countrified house, as much like a hobbit-hole as possible: it was long and low, with no upper storey; and it had a roof of turf, round windows, and a large round door. As they walked lip the green path from the gate no light was visible; the windows were dark and shuttered. Frodo knocked on the door, and Fatty Bolger opened it.A friendly light streamed out. They slipped in quickly and shut themselves and the light inside. They were in a wide hall with doors on either side; in front of them a passage ran back down the middle of the house. Frodo looked round. It did look like home. 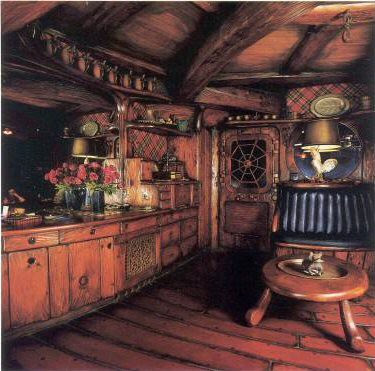 Many of his own favourite things - or Bilbo's things (they reminded him sharply of him in their new selling) - were arranged as nearly as possible as they had been at Bag End. It was a pleasant, comfortable, welcoming place; and he found himself wishing that he was really coming here to settle down in quiet retirement. It seemed unfair to have put his friends to all this trouble; and he wondered again how he was going to break the news to them that he must leave them so soon, indeed at once. Yet that would have to be done that very night, before they all went to bed. The travellers hung up their cloaks, and piled their packs on the floor. Merry led them down the passage and threw open a door at the far end. Firelight came out, and a puff of steam. Merry and Fatty went into the kitchen on the other side of the passage, and busied themselves with the final preparations for a late supper. Snatches of competing songs came from the bathroom mixed with the sound of splashing and wallowing. The voice of Pippin was suddenly lifted up above the others in one of Bilbo's favourite bath-songs. as splashing Hot Water with my feet!" There was a terrific splash, and a shout of Whoa! from Frodo. It appeared that a lot of Pippin's bath had imitated a fountain and leaped on high. Merry went to the door: 'What about supper and beer in the throat?' he called. Frodo came out drying his hair. 'There's so much water in the air that I'm coming into the kitchen to finish,' he said. 'Lawks!' said Merry, looking in. The stone floor was swimming. 'You ought to mop all that up before you get anything to eat. Peregrin,' he said. 'Hurry up, or we shan't wait for you.'" My little brother loves to be read aloud to when he is sick. I remember, when I was still at home, reading to him 'till I was hoarse! Lovely Rosie! One of my favorite passages from The Fellowship. With mushrooms for after! You made me want to get hold of this book and re-read it! !